Scaling up: Brian and Sassy Henry of Pawleys Island Specialty Foods. 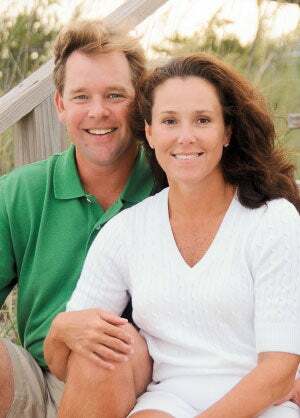 Brian and Sassy Henry had always planned on slow and steady growth for their South Carolina company, Pawleys Island Specialty Foods. That was the sensible approach. But the appetite for their Palmetto Cheese spreads grew so quickly that the married couple--Brian serves as president and CEO; Sassy creates the recipes--could no longer meet manufacturing and distribution demands on their own. So they made the decision to team up with Duke Sandwich Productions, an Easley, S.C.-based manufacturer that presented them with a growth opportunity they simply couldn't ignore. "They shared the belief that Palmetto Cheese could really go big, and that if it did we'd need to be prepared with the capacity to handle it," Brian says. "They found a facility eight times larger than their current one and said they were willing to move into it as long as we were committed to staying with them long-term." Seeing the offer as a vote of confidence in their company's future, the Henrys agreed. Duke Sandwich developed a new 80,000-square-foot facility in 2012 and hired additional staff to handle production. "Strategically, it was a long-term move that gave me the license to say, 'Now we can go all out,'" Henry says. Today Palmetto Cheese is carried in more than 5,000 stores in 31 states, and sales jumped from 1.1 million units in 2010 to 4.1 million in 2013. Startups, particularly those funded by outside investors, go into business with growth in mind. But expanding too quickly can cause serious growing pains. From adding employees and office space to increasing production, expanding services or extending product lines, doing too much too soon can have devastating consequences. Every stage of growth takes a bit of good faith, but there are some reliable indicators that your startup may in fact be ready to scale. Look for these signs before you leap. 1 You have the right team in place. Bob Davis, general partner at Highland Capital Partners in Cambridge, Mass., says when his venture capital firm is considering an investment opportunity, one of the crucial deciding factors is whether the company has the right staff to accelerate growth. "Very often you see companies that do the same thing, where one wins and one loses, such as Facebook and Myspace," he says. "So why does one win and one lose? Generally one has a great team that out-executes the other." In addition to strong leaders, it's important to have a properly built-out team of qualified workers who are invested in the company's success. "Without great leaders and then the right people in place, even the greatest idea is going to struggle," Davis says. "But with an amazing team, mediocrity can turn into something special." But it's not just about the internal team. For the Henrys, the green light to growth came when they realized they had a manufacturer partner, Duke Sandwich, that wanted to grow with them. "We are their No. 1 brand as far as production, and their new plant has the capacity to handle our growth for years to come," Henry says. 2. Customers are coming to you. Henry says that when his business gained a certain amount of momentum, he no longer had to approach chain customers about selling Palmetto Cheese. Instead, he was fielding requests. That indicated to him that his brand was reaching a level of awareness that positioned it for growth. "Costco came to us fairly early on in the process, and that was an eye-opener," he says. Next came retail giant Publix (spurred by requests from customers), and it wasn't long before Kroger, Piggly Wiggly and other supermarkets followed suit. "We have more than 20 grocery-store customers that represent 5,000 grocery stores, so one request that pans out is significant to our growth." Indeed, each additional client can be a catalyst for growth, even if you are initially reluctant to diversify or expand beyond a particular region. "Over time you realize you can build warehouses and do the things necessary to build it out, but you've already shown in one market you can make it work," Davis says. "That allows me to look at that business and feel very good about its prospects." 3. You're realistic about what your company can handle. Even if you've conquered a particular market and know that when the time is right you'll have what it takes to move to the next one, you need to recognize when to say no. Laura Kozelouzek, founder and CEO of New York-based Quest Workspaces, is constantly looking for new opportunities for her business, which was founded in 2010 and provides serviced office space in 11 locations in Florida and New York. "You have to be discriminating in terms of what growth you can handle. You need to look at the economic benefits and consider your existing infrastructure and resources," she says. For example, while her business typically owns the locations from which it operates, she recently took the opportunity to manage a portfolio of office buildings--an extension that worked because of the properties' proximity to her existing centers. "We were able to leverage the systems we already have in place there, so that was a growth opportunity that made sense," she says. Conversely, another landlord with whom she had a solid relationship wanted to incorporate her services into its office buildings in markets outside of Quest's two core areas. "I had to pass, because it would have brought us into markets where we'd be spreading ourselves thin," she says. "That was an instance where saying no was actually a great growth strategy." 4. Your lifestyle can handle the additional workload. While there may be plenty of clear signs that your business is ready to expand, successful growth can be tough to achieve if you're not personally ready for the accompanying commitment, warns Troy Hazard, author of Future-Proofing Your Business. Because it can take up to 12 months for operations to achieve a normal rhythm after a growthspurt, expansion can affect not only your business but also your personal life, your family and even your health. "You have to be ready to duplicate yourself when you open that next location or expand your offerings," Hazard says. "Until your new management team can fully run things for you, you are the one who has to do double time between the existing part of your business and the new, so you have to be prepared for the sacrifices that will take." 5. You have the cash. Many startups fail to properly gauge how their sales cycles dictate their ability to expand, which can cause a serious deficit in cash flow. Hazard says it typically takes at least four months to see a return on capital investments made to expand a business. "Growth costs money, and a lot of people forget that," he points out. "You cannot be ready to grow unless you're in a position to carry the business until the sales catch up with the investment." Positive cash flow is what gave John Olajide, founder and CEO of Axxess Technology Solutions, the confidence to grow his Dallas-based home-healthcare company from 15 to 80 employees in just one year. The growth was warranted, Olajide believes, because he's getting the contracts he needs to build out his system and handle increasing demand. "Our software is a recurring revenue model, so as we've grown and taken on additional customers every month, the revenue from the previous month was already there," he says, adding that Axxess signs up an average of 50 home-healthcare organizations per month. "That's a lot of growth to take care of all of those people; we need to make sure we're providing great services and support." 6. You're meeting established goals. Many entrepreneurs find it's easy to make excuses when they miss the goals they've laid out in their business plans. James Fisher, co-founder of Cincinnati-based travel-planning site Roadtrippers.com, says proving you can meet defined objectives builds both internal and external confidence in your company's ability to expand. When his business launched in 2012, investors gave his team a challenge to capture half a million users per month and to hold those numbers for two months. While Fisher thought it would take 12 months to achieve that goal, Roadtrippers was able to accomplish it in just two. "That was a clear indicator to us that our growth was warranted," he says. "When you can show a growth story, it warms investors and gives you a little stability in terms of confidence that goals will be met from there."